With the 'disarmament decade' drawing to a close, perceptible changes in worldwide demilitarization are taking place. The initial post-Cold War enthusiasm for a 'peace dividend' is tempered somewhat by revelations of a recent deceleration in disarmament initiatives. 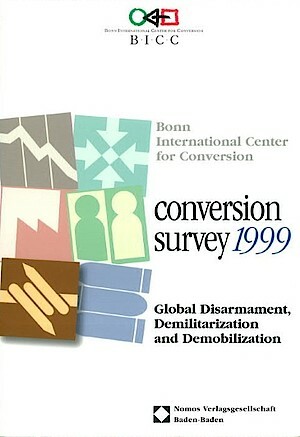 While this trend is reflected in the current Conversion Survey 1999, published by the Bonn International Center for Conversion (BICC) a positive overall balance in terms of international security continues as a result of the many successful conversion efforts. The update provides an overview of the relevant issue areas with emphasis on developments in the years 1997/98. This includes global empirical data such as the BICC disarmament Index, and a review and analysis of country and regional trends in military expenditures, reorientation of military research and development, employment in arms production, defense industry restructuring and conversion, demobilization and reintegration of armed forces personnel and the disposal of surplus weapons. A topical study of base closure and redevelopment draws on the experiences of countries at various levels of economic development in order to highlight lessons for the efficient redevelopment of military infrastructure for civilian use especially in developing countries.